These 5" stainless steel culinary tweezers offer a perfectly secure grip when fingers or other tools would be too clumsy for small, delicate food preparation. Plus, the durable stainless steel material won't waiver even when firmly squeezed. Easily remove fish bones and clean poultry using these tweezers for a hassle-free approach. These little culinary tweezers are great! They are so handy to have around especially for plating up and garnishing delicate foods. They are nice and strong and good quality. I am sure they will last a long time. This is a great product. It is very heavy duty and the precisely made, with no gaps when closed. I have used them several times with no issues. I was looking for just one pair of culinary tweezers to pick the bones out of fish. For less than the price of one pair at other stores, I was able to get two! Highly recommended product! love this tweezers, I process a whole fish once in a while and i use this tweezer at work to take the pin bones out. Great for deboning fish and come in handy when plating. Great quality, should last for a long time. The size if just right for me. This tweezers are bigger than I expected, but work like a charm. Good quality for what I can see. Easy to handle and operate. For the price is really a good bargain. Fish tweezers! You need these if you are butchering your own whole fish and need to remove the pin bones effectively. They work well and hold up better than pliers and clean up perfect. This stainless steel tweezer set works very well. I have used them with all types of fish bones and they provide great resistence when needed. I would highly recommend. This product is perfect for fish and chicken bones but I have also had great success using this product to claw out some eggshells becore my omelette hit the pan! I've mostly been using tongs I bought from webstaurant whenever I prepare desserts that need precison, but these work so much better! A must have if you do anything delicate. honestly for some tasks, like smaller bones, i like to use needle nose pliers, but for larger fish bone and some plating details, these are a good set of tweezers. and inexpensive (plus you get two, so that's nice). Very handy little tweezers - good size for serving appetizers and small plate items. The edge of the tweezers are flat with no grip to them which makes it tricky to grip slippery things and the resistance when you pinch them together is maybe a little more than one would expect, but that might loosen a bit with time. Really useful for removing things like fish bones. Have to squeeze a moderate amount to get a grip, but you get the hang of it. I purchased these mainly for the cheap price and I am pleased with the value. That said, for certain smaller bones, the tips do not line up completely flat, meaning that I have to position the bones toward the rear of the tips to get a secure grip. Over it is a good product, but perhaps look elsewhere if you deal a lot with thinner bones. I do use this for certain tasks, but sadly, I would not recommend this. I use these for home use. They've been great to remove small bones that would otherwise get me fired from my most harshest critics- my family. They seem well made and will certainly last. Love the size of these tweezers. They are a larger size than the other tweezers that we have which made them much easier to grip and hold on to. These fish tweezers are hands down, the absolute best option available for boning fish. It was a revelation when I used these for the first time. What makes these unique is that they grip tiny pin-bones well without cutting them. If you've ever had to clean trout, you know how frustrating it can be to cut through the tiny bones. Great stainless tweezers last a long time and allow for easy removal of bones from large fish fillets. Works on splinters in a pinch too. These are a bit stiff when first using them. But they have worked well for getting salmon bones out of filets. I haven't tried them for anything else. We cook fish in our Kosher kitchen almost every day and these are wonderful. They are durable and strong yet have a nice point in order to easily get to those bones Great that they also come in an affordable two pack! Pros: Good price and they come in a two pack. The package says these are good for removing bones from fish and chicken as well as for cleaning seafood. I found that I could get a better grip on my shrimp peels and legs with my hands, but I do think these would be good for removing bones. I also think I will use them for selecting and applying individual cake decorations. You can also use the Stainless Steel Culinary Tweezers in your first aid kit to pick up gauze's and patch up cuts and bruises. I am in the process of building my home-school first aid kit bag and instead of just having disposable tweezers, I'd also like to have some that can be washed off and reused. We use these when placing dragees or other decorations on intricate cakes. Would have liked them a bit easier to pinch together, but very good thick stainless quality. We use this to take small fish bone out. It work very good it tweez very thin fine fish bone and not too sharp to cut the bone before take it out. These are so handy, I have found multiple uses since they arrived in my home 8 months ago. Different than a set of regular tongs they really grip things that are a bit more precarious. They are also decent for picnics and other occasions when gripping small pickles or slices are needed. I have used them for olives, maraschino cherries and various other quick retrieves. They wash up easily in the dishwasher. And are great to store as they take up so little room. I recommend them for everyone! These tweezers work great and can't be beat at this price. I use them mainly for seafood and they work wonderfully. They even come in a pack of two; I keep a pair in each kitchen. These culinary tweezers make deboning a fish a breeze to do. They also appear to be holding up well after moderate use. These are not for placing food on a plate though. Amazing price for a solid set of tweezers - perfect size for removing pin bones and easy to clean. Extra pair for your outdoor kitchen. Two culinary tweezers for the price of one? How can you go wrong? 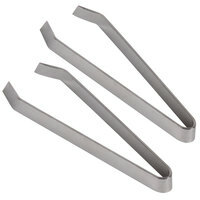 These tweezers are made of stainless steel and work well with various type of bone. These five inch stainless steel tweezers are great for getting those teeny tiny bones out of fish. They work just like fish tweezer but are cheaper! These are a great economical buy if you dont want to spend a lot of money on fish tweezers. Great for having a few of them laying around. These tweezers are among the best for competing tasks such as removing pin bones from fish and even tendons from chicken!!! Not to mention, you get two!!! I use these tweezers almost everyday in the kitchen! Very sturdy and easy to handle.